An elite team of seven world-renowned chefs is charting an exciting course for dining across our fleet. With their global expertise and diverse culinary specialties, they’re adding inspired new signature dishes to our menus. The Culinary Council is led by Holland America Line’s Master Chef Rudi Sodamin. • Rudi Sodamin, Master Chef and Culinary Council Chairman oversees all aspects of onboard dining, in addition to bringing his influence and expertise to Rudi’s Sel de Mer. • Jonnie Boer offers a Taste of De Librije which will bring the flavors of his internationally acclaimed restaurant, De Librije, on board select sailings through special evenings in the Pinnacle Grill. • David Burke influences the Pinnacle Grill Menu. Burke will continue to enhance the menu at the Pinnacle Grill by adding contemporary flavors and new signature recipes. • Jacques Torres chocolate confections are a sweet indulgence, a world-renowned chocolatier known as Mr. Chocolate, Torres will guide masterful chocolate desserts for Holland America Line’s dining venues, as well as the Chocolate Surprise Dessert Parade featured on the last gala evening of every cruise. • Elizabeth Falkner will be introducing a variety of new, lighter fare to venues across the fleet. Frequently interviewed and quoted on healthy cuisine and eating habits, she does both savory and sweet, traditional and modern and enjoys taking people on adventures through food. • Ethan Stowell celebrates the flavors of the Pacific Northwest. A recent addition to the Culinary Council, Stowell will bring the unique flavors of Alaska and the Pacific Northwest on board ships sailing in the region. Also known for his pasta and Italian dishes, Stowell will introduce several of his recipes at New York Pizza and select Lido Market stations on all ships. • Andy Matsuda, the newest member of the Culinary Council, will lead sushi offerings in Lido Market as well as the sushi menu available in Tamarind on select ships. 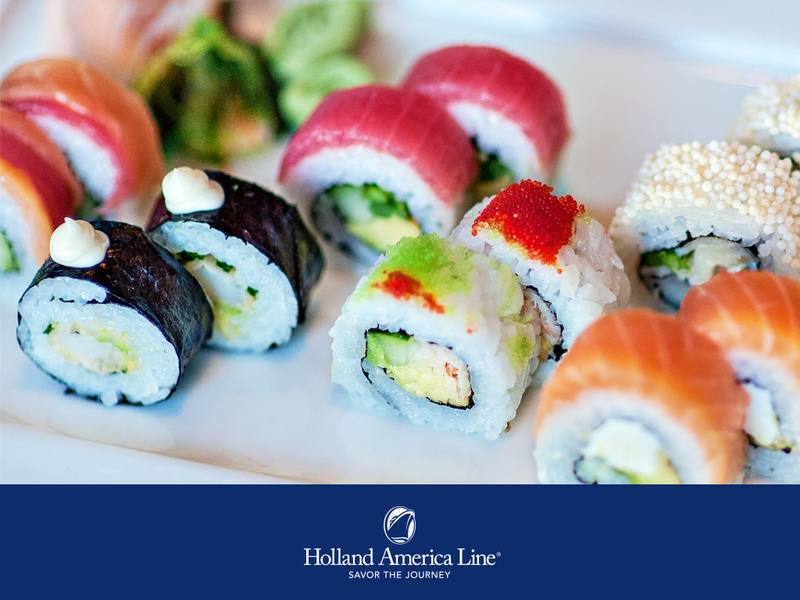 Aboard Nieuw Statendam, Matsuda’s creations will be featured at Nami Sushi, the new sushi bar inside Tamarind. No other cruise line has seven global culinary experts partnering with them to enhance all aspects of onboard dining. Adding their collective experience, passion and creativity across our fleet brings the ultimate in refined culinary options to Holland America Line guests.